It’s difficult to find time to go out and purchase individual items here and there to do activities with our children. Here are some helpful crafting tips to help you save time and tears! Whether we are cooking a great a meal or playing with our children, we always hit the internet first. Google is amazing, we can easily find activities that we have all of the supplies for. We simply enter the supplies we have, add some keywords like “children crafts” to the search query and we get a list of crafts using the supplies we have available. With a little quotation magic we can narrow down our search a bit so it finds what we are looking for better. The quotations will trigger Google to return results where those phrases are found exactly, it will exclude websites about “paper” or “cleaners”. There are a lot of crafts we can do with these couple items. We check out the image results and quickly scan through them to find one we don’t need anything additional for. A lot of the time we find activities using supplies we didn’t realize we could use. Normally we always find an activity with what we have available at home but there are still some essentials that every household learner must have! We usually buy something whenever we are out and over the past couple years we’ve collected a nice little “nest-egg” of crafting supplies but we know how much of a downer missing one ingredient can be. Most of the time we opt for a simpler activity, sometimes we take an hour long trip to the dollar store and back, and unfortunately sometimes we just scrap craft-time and head outside. 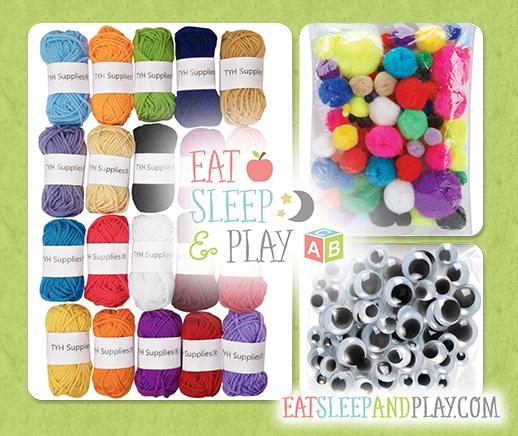 Here’s a short list of crafting supplies that every household must have! We’ve organized an Amazon list of the first 11 items that you can use as your basic crafting supply toolbox. The last 5 items may be found at home or at your local grocery store. Click here for the full Amazon list! If you are not an Amazon Prime subscriber, now is your opportunity! They offer FREE 2-day shipping on many items, we try to select only Prime-eligible items for our carts! Click the banner or link below for a free 30-day trial membership! Try Amazon Prime 30-Day Free Trial Please send us your comments, suggestions and experiences below, if you have any of your own crafting tips to share please do so as well, we would love to elaborate the post!